You are currently browsing the tag archive for the ‘figs’ tag. Hey everyone!! Yesterday my grandparents came from Montenegro! They were on vacation for 2 months. They brought so many good stuff like pomegranates, clementines, and dried figs!! Tonight I made some cookies. I ran out of many baking things like brown sugar, powered sugar, and chocolate chips so I wasn’t sure what to make. 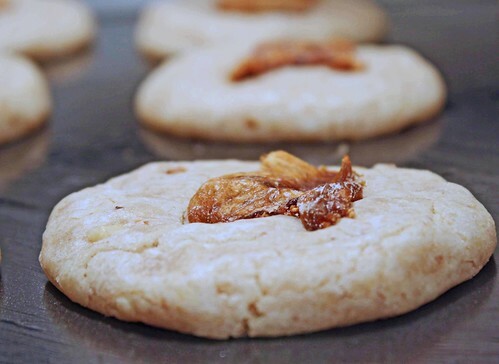 I looked at V’con and say an awesome recipe for Fig Smushed-Anise-Almond Cookies. I didn’t have the almonds or anise but I did have the figs! Instead of Almonds I used walnuts and instead of anise I used more vanilla extract. I call them Fig Smushed Walnut Cookies. My cookies came out really really good! As soon as I bit into them they brought so many memories. They reminded me of the cookies my mom used to make when she would bake. There a little bit of everything a little bit chewy, a little crispy and so good! For some reason I always make my cookies big and I never make the exact amount, these were really supposed to be a bit smaller but oh well. The walnuts really help the fig cookies as walnuts and figs are the perfect couple! 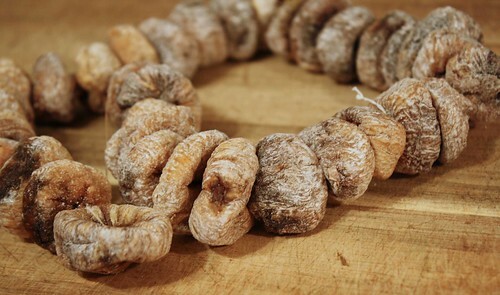 By the way walnuts are awesome to stuff into dried figs! I won’t post the recipe up since I don’t have much time and anyways its in V’con and everyone has v’con, right?? All I did is use walnuts instead of almonds, used regular sugar and used regular figs. The recipe is on page 234-235 in Veganomicon.